A little shocked at how many conservatives are telling me they wouldn't support Trump over Hillary. This could be a bumpy ride. No mass political party heads into a national election in lockstep. Promises to stay home or, at best, to vote against the other team’s champion rather than for one’s own, are common, but the prospect of a Republican Party nominee heading into the Fall election with a substantial portion of self-identified conservative activists, intellectuals, donors, office-holders, and voters in open revolt would be unlike anything we have seen in decades at least: The dis-assembly of a national political coalition – from the top down and the outside in. Of course, we have a long way to go, and how much the exclamations of the previous Winter will have faded in comparison to the all-caps boldface value propositions of the Fall – Supreme Court, immigration, and so on, weighted higher or lower by estimated odds of victory – is impossible to predict. 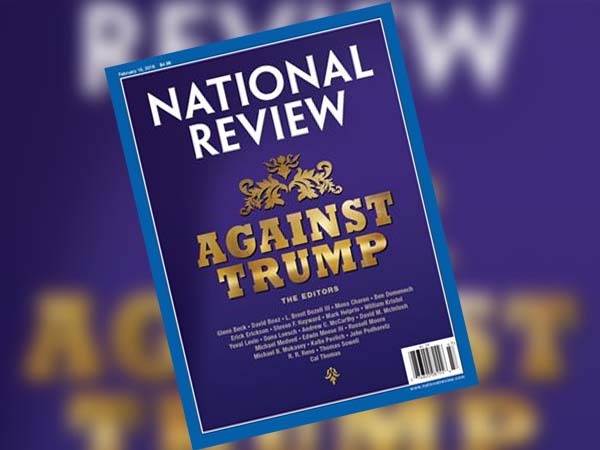 Still, even if a late October poll of National Review writers shows them misgivingly “For Trump,” their editors and many rank and file conservative Republicans, the ones who thought they were booking a very different passage, have gone too far down the plank, with the Captain-in-waiting’s prodding, ever to walk all the way back. Trump: "Karl Rove is a bad guy. He’s just a bad guy. George Will is a bad guy. Stephen Hayes is a bad guy. Charles Krauthammer is a bad guy"
Between Trump and Scalia, hard to escape the feeling that 2016 is an Ending, of some sort, for American conservatism as we've known it. If Trump wins the nomination, Republican dissidents – an odd position for committed conservatives whose views have not changed, but who have found the ground moving beneath their feet – might vote for, endorse, and actively support the Democratic Party nominee, assuming he or she – to be realistic, she – runs convincingly enough as a centrist. They might sit out the election. Some might turn to a 3rd- or nth-party nominee. One alternative would be for conservatives to break away and form their own 3rd party, in a Cons-in-Exile run of the sort that columnist Jim Geraghty outlined: One imagines some ideologically Reaganite rump of rumps, venturing forth on the theory that it could win, either directly or after an Electoral College deadlock, or at least on the theory of standing athwart and yelling. Yet regardless of where the splinters and larger sections finally settle, this moment already is a unique one, since Trumpism represents the potential of a hostile takeover of a party. Left-liberal analysts are fond of exclaiming (always as if for the first time, rarely taking any degree of responsibility themselves) that the movement of Rush Limbaugh, Sarah Palin, the Tea Party, Birtherism, and so on chose to mount and ride the know-nothing populist tiger long ago, but the irony runs deeper. The Trump phenomenon may demonstrate how much the democratization of primary processes has always run counter to republican and conservative political ideals, as Jeffrey H. Anderson and Jay Cost strongly imply when laying out their proposal for an alternative nomination system in 2013. From title down, their “Republican Nomination Process” clearly refers both to a process for the Republican Party and to a process that would actually reflect “small-r” republican values. The history of American politics and of the American political system at least since the Progressive Era, arguably since the Founding, seems to have been a counter-movement towards lowest-common-denominator democratism or “numerical” majoritarianism, away from alternative concepts of self-government. Of course, the primary system is not even an imbecilic majoritarianism that bestows the Mandate of Heaven on the candidate with 50.1 while sending 49.9 into internal exile: It is something even more degraded, more like brute numericalism or whatever name we might prefer for a system that treats vote totals more like scores in a game, and is designed to convert “first past the post” pluralities of votes systematically into majorities of delegates and the sounds of unified acclamation. Perhaps this type of democratization of the process was destined eventually to produce a demagogue, as everything turns, finally, all the way upside down: A Republican Party more democratic, under our common degraded concept of democracy, than the Democrats, those stalwarts of stability, comity, and the superior wisdom of the elite. Yet the not simply counter-majoritarian but counter-factional and counter-demagogical features of American liberal democracy do remain integral to the system. Indeed, those who refuse to panic over the prospect of a President Trump expect to rely on systemic road-blocks or “veto points,” or on the sheer reality of American political paralysis, to prevent an unpredictable and intemperate chief executive, alter ego of his unpredictable and intemperate constituents, first from doing too much harm, second from doing too much of anything at all. Again, such speculation is far ahead of where we are to this point: The options before movement conservatives and other Republicans in the Fall will follow upon what exactly Republican and Democratic delegates do in the Summer, and we’re still waiting for voters and campaigns to do their work in the Spring. All the same, as of this writing it appears that only an Act of God would prevent Trump from entering the Republican National Convention at least in a position to expose its fractures, and the image of a President Trump is already one that the Republican or “Republican” electorate, or roughly 35% of it, is forcing us to contemplate, as is the attitude of his fellow candidates. The other Republican candidates should be asked how they can continue to take the position they'll support Trump if he's the nominee. Unlike pundits such as Bill Kristol or all of National Review’s horses and people, partly as a result of the pledge the Republican National Committee forced on candidates when the main objective was keeping Trump and his followers in the fold, not preventing them from taking it over, the traditionally Republican Republican candidates seem to have little choice but to treat “Donald” and his followers as no more or less authentically Republican than anyone else who chooses to claim as much. Even Jeb Bush, Trump’s whipped boy in one debate after another, is in theory committed to support the party’s nominee in the Fall. In times such as these, party loyalty raises the question of what a party is at all in America 2016 – or at least what it can possibly mean to be a Republican, if Trump is one, and potentially the standard-bearer. ‹ Who or What Is Using “Commenter Archive” and “commenter-thread”? 1 Pings/Trackbacks for "The Party Deconstructs"